Mission Statement: An enterprise project designed to promote education, leisure and entertainment to benefit the community. In 2004 an idea was hatched that was to become the Castlemaine Hot Rod Centre. Prior to that, individual local hot rodders had spent the best part of 25 years building up the hot rodding industry in the local area to the point where it had become an important part of the local economy and as such a provider of a significant number of jobs in the region. Having grown the industry to that point it was becoming evident that some of it would be at risk if those businesses were sold and moved elsewhere. The need to add something to the mix to ensure that hot rodding continued to grow and prosper was seen as an emerging problem that needed to be addressed. This became a topic of discussion at Castlemaine Rod Club meetings where the decision was made to do something about the situation in a positive way. That decision involved a series of meetings to investigate the feasibility of developing a complete resource centre for hot rodding that would reinforce the district’s reputation in the field and hot rodding in general. The first major outcome was that the resource centre project should be an entirely stand alone exercise, divorced from the rod club itself so that it didn’t spoil the social nature of the club or attach any risk to members who might not want to be involved. The local shire was approached for guidance and support which has been forthcoming from the mayor down. In fact the mayor of the day, Cr Jim Norris, considered it such a good idea that he called an official meeting to brainstorm the concept and set the process under way. That meeting was held in 2004 and resulted in a steering committee being formed to advance the concept. A group of almost 30 local hot rodders put their hands up to be involved and the Castlemaine Hot Rod Centre project became a reality. But that was just the beginning. Since then there have been three and a half years of constant meetings and planning to get the idea into a more concrete form and to establish an overall management company. Approaches were made to many local and Melbourne based businesses who could help us to fine tune the concept and set into motion in such a way that nothing was overlooked in establishing the centre. At the same time the steering committee set about looking for a suitable site where the Hot Rod Centre could be physically located. Well here we are 2013, appologies for the lack of updates but I will try to get you up to speed. We have been working extremely hard promoting our concept and we have had nothing but optimism and encouragement, and may I say astonishment from some. We have worked with VACC and TAC in promoting what we already have existing here in Castlemaine, we hosted the appropriate personal here in Castlemaine and they were quite suprised with the amount of ‘automotive related’ industry we have here and the employment it creates. We look foward to their continued support as we move on. We also are working with the local Secondary College and have an agreement in place. The college, along with our support were sucessful in receiving a grant to enable us to establish a Vehicle Inspection Facility on their premises. This is set up with a winch and hoist to enable our engineers to inspect vehicles for registration.We are working in conjunction with the TAFE program and involve the students whenever we get the opportunity. The staff at TAFE were able to follow up from our suggestion to source a Hot Rod Project which was commenced at another College but had been abandoned when there was a change of staff. 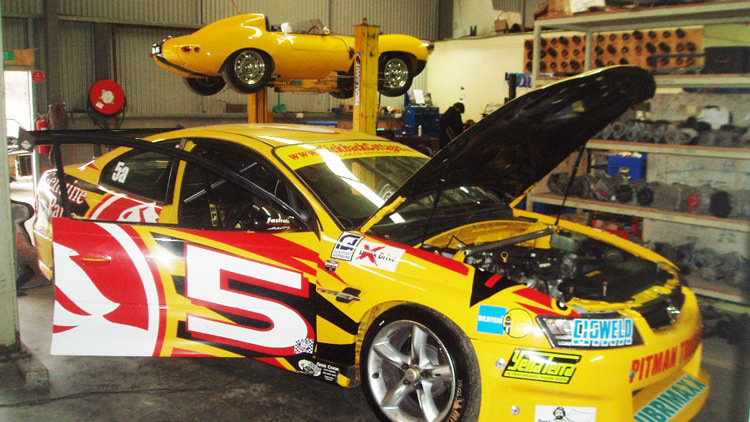 Castlemaine TAFE students are now learning our trade ‘hands on’ with their own Hot Rod. We are able to help them with this project by pasing on our experience and ensuring they build this hot rod to the correct specifications. We are happy to see them enjoying the experience and they are so willing to learn. This could help them in the future if they choose to go down the path of and one of the automotive related trades. We have caught the attention of the current Victorian Premier Denis Napthine, he was breifed on our concept via our local Mount Alexander Shire Councillors and he now is extremely supportive and has encouraged other local polition’s to offer their support. We are currently working with Department of Planning Victoria in conjunction with the Mount Alexander Shire to enable us to ‘take the next step’ which we hope will be the purchase of a suitable property. We had identified two suitable sites in our area but for one reason or another they have not worked out, we are still looking and may have some news very soon. We have been slowly boosting our member numbers which is encouraging. Our Bendigo Bank Community Enterprise has been in place for 2 years now and is also growing, we encourage you to make a pledge and support us and the Bendigo Bank without costing you anything. Make a pledge, become a member or contact us now!